If you are of the baby boomer generation (as I am) you either owned an air-cooled VW Beetle at some point in your life or knew people (probably more then a few) who did. The upside of the VW was it's price (a good running used one could be had for $100.00 - $200.00) , ease of maintenance and repair (with the help of a few friends you could change an engine in a few hours) and parts availability (they were everywhere and used parts were dirt cheap). The downside was they were slow, ill handling, had feeble heat and limited space for people and "stuff". The Squareback had all of the Beetle's good qualities and addressed some of its bad ones. The Squareback had the VW "pancake" engine in it. Similar to the Beetle's opposed four, but with a different cooling system, the pancake engine was around 15" tall, giving the Squareback a lot of room in the back, which, along with the trunk in the front, gave it an amazing amount of cargo space. The Squareback's front suspension was different from the Beetle's, giving it a slightly better ride and handling. It was still slow, though, with 60 MPH coming in around 20 seconds. The heat was still sourced from the exhaust system and, at least for those of us who get a real winter, was still pretty much useless. The Squareback being offered on eBay appears to be in immaculate condition. Like most cars of its day the Squareback rusted, but this one appears to be rust free. Red is a great color on this car and the whitewall tires are period perfect. The interior looks immaculate. If you're a big fan of air cooled VWs or just looking for something unusual to drive and show, the VW Squareback is worth looking into. It's not as common as the Beetle and a lot more competent to drive. For a 38 year old car, it's reliable and parts are relatively cheap and easy to get. Located in Georgia, click here to see the eBay listing for this car. Click here to find the VWType3.org website. 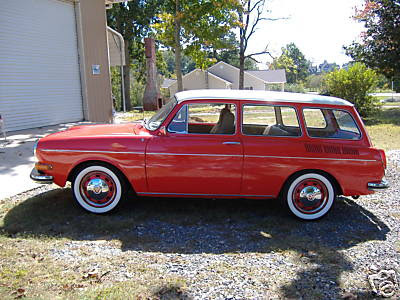 Click here to find the Vintage Volkswagen Club of America website. I'm not a baby boomer, I'm a gen xer, but I'd love to own this car. Great blog by the way. I just found it this afternoon. I had a '69 Squareback with a factory roof rack. Like you said, it was great except for the heater, and the acceleration..... There was a little rust behind the front wheels and just in front of the front door hinge/A pillar, same as every Squareback. The mechanical fuel injection did it in. Is the square back still available for sale?